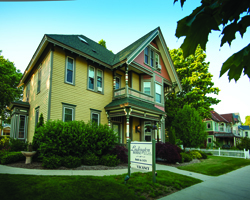 The charm of a bygone era awaits you at our historic home, built in 1878. We are centrally located, a short walk from Lake Michigan, many fine restaurants, quaint shopping and the Pere Marquette Harbor. Each room is tastefully decorated and includes a private bath. The corner lot is beautifully landscaped with ample off-street parking. No pets, no smoking and no children under 10. Note: Some map locations are approximate. Please call the venue at 231.845.7769 for exact directions.